WhiteCap is a real-time music visualizer and screen saver featuring a futuristic, morphing wireframe mesh that generates stunning graphic effects along with dynamic backgrounds and colors, to form thousands of visual combinations. 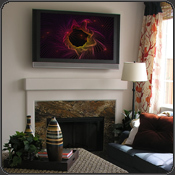 WhiteCap includes easy to use on-screen menus with configurable visual effects and customizable settings, which let you save favorites and control your visual experience. WhiteCap is designed to be extremely dynamic and musically reactive, with a unique look and feel that is bold, yet sleek and sophisticated. WhiteCap is the ideal visual complement to your favorite live and pre-recorded music, creating irresistible "eye candy" that looks great in any environment. The free trial of WhiteCap is easy to install and easy to use. It lets you experience its uniquely reactive, dynamic visuals firsthand and gives you a taste of the many advanced features WhiteCap Gold and Platinum have to offer. Download WhiteCap Free Trial today!